In this brilliant jewel of a book, Stephen Mitchell expands and deepens the classic fairy tale in the most unexpected ways, giving new emphasis to its message of the transcendent power of love. The Frog Prince tells the story of a meditative frog’s love for a rebellious princess, how she came to love him in spite of herself, and how her refusal to compromise helped him become who he truly was. This is a magical book that moves (amphibiously) from story to meditation and back, from the outrageous to the hilarious to the silly to the sublime. Profound, touching, a surprise from beginning to end, written in a prose as lively and unpredictable as a dream, The Frog Prince tickles the mind, opens the heart, and holds up a mirror to the soul. There are two kinds of women: those who marry princes and those who marry frogs. The frogs never become princes, but it is an acknowledged fact that a prince may very well, in the course of an ordinary marriage, gradually, at first almost imperceptibly, turn into a frog. Happy the woman who after twenty-five years still wakes up beside the prince she fell in love with. Entropy is the name that our scientists give to this phenomenon, the irreversible downward slide of events: life becomes death, order becomes disorder, princes become frogs. That is the way of the world, scientists say, and most of us solemnly nod our heads in agreement. But the rules of physics, though they resemble the rules of an ordinary marriage, do not at all correspond to the rules of the human soul. There are no exceptions to the rules of physics, whereas the rules of the soul consist of nothing but exceptions. That is why I want to tell you a different kind of love story, about a frog who became a prince. It all began… But let me step back and begin before the actual beginning. There is a good deal of background material that I ought to fill you in on, and a certain number of necessary explanations. The traditional rendition of the story, which we can call the Condensed Version, tells everything in six and a half minutes, plunging straight into the thick of things with the Princess and her golden ball. Besides, it is a version for children, who don’t require explanations of the extraordinary. Children understand that Once upon a time refers not only —not even primarily—to the past, but to the impalpable regions of the present, the deeper places inside us, where princes and dragons, wizards impalpable regions. Let me start by reminding you that not all princesses in these ancient tales are beautiful. They don’t have to be: they are princesses. But our princess was, in fact, a most attractive young woman. How attractive? Well, the Condensed Version, which is usually quite straightforward about details, gets caught up in its enthusiasm when it describes her. “She was so beautiful,” it says, “that the sun, who had seen so many things, was filled with wonder every time he shined onto her face.” This is charming, to be sure, but why the hyperbole? It is true that the Princess was lovely; you might even have called her—on certain days, in certain moods, in certain rare subtleties of light—beautiful. But there are many beautiful young women scattered across the globe, walking in high heels or in sneakers down every main street of every city on earth, and if the sun were to stop and stare at each of them, our days and our nights would be longer than I can easily tell. No, exaggerations like this don’t occur to a storyteller out of the blue; there is always a reason, and the reason here, I think, is that the more difficult side of our princess’s character must have made the teller of the Condensed Version uncomfortable. For the outer mirrors the inner, and there is no character flaw that, to a discerning eye, does not manifest itself on the faces of even the surpassingly beautiful, making them far less a cause for wonder than is the face of a plain young woman with a loving heart. In short, the Princess was proud; she was ungrateful; she was headstrong. But we will come to all that in due course. Our story takes place in the High Renaissance, in one of the small, prosperous French kingdoms whose châteaux along the Loire and the Saône are among the glories of European architecture. “French kingdoms, plural?” you may be asking. It is a natural question, and I must stop again to explain. A CENTURY AND THREE quarters before our story begins, during the first, tentative stages of the Renaissance, when one Western mind-world was dying and another was in the throes of being born, the wisest men and women in Europe could observe a hairline crack, as it were, on the surface of reality. This kind of crack is more likely to form in the life of an individual than in the life of an entire culture. When a woman or a man undergoes a deep spiritual transformation, there are certain critical points along the way when what is partial needs to be shattered in order to become what is whole. At such points, the hidden powers and illnesses of the soul may be unleashed, giving rise to bizarre phenomena in which darkness and light are interchangeable and in which it is sometimes difficult to distinguish miracle from madness. That is what was happening in Europe during the early years of the Renaissance, and why the wise women and men of the time were so deeply concerned. Travelers had begun to sight giants in the mountains and forests. Wish-bestowing rings were appearing suddenly on the dusty back shelves of jewelry shops in small provincial towns. Farmers’ sons would plant a bean, and it was a toss-up whether an ordinary beanstalk would grow in its place or a beanstalk whose top punctured the clouds. Fishermen would reel in their catch, and sometimes a fish would silently thrash about in its death-agony as fish had always done, and sometimes it would stand up on its tail and, in a suave baritone that might have been coming from the mouth of a character in a Noël Coward play, offer the fisherman three gifts in return for its freedom. Hunters would be riding in pursuit of a deer or a fox, and suddenly the deer or fox would halt, wheel about, and address them in perfect High German or in a French so elegant that a committee of scholars from the Sorbonne would not only have approved but applauded. Articulate animals were, in fact, popping up all over the place: talking deer, foxes, frogs, flounders, hares, hedgehogs, salamanders, goats, geese, mice, rats, cats, dogs of every breed, nightingales, sparrows, owls, hawks, wolves, horses (whole horses or, on one occasion, just a severed head), donkeys, lions, bears, and assorted other large, hitherto-silent carnivores. Magic was afoot everywhere. Things were getting out of hand. Now, it is perfectly fine for a deer or fox, in a dream or on one of the other borderlands of reality, to give us a well-timed piece of advice once in a great while. But when what happens inside the soul spills up into our outer, physical world, life can become extremely difficult, and sometimes extremely frightening. And when Once upon a time erupts across an entire culture, things can get very dicey indeed. In such a crisis, we need all the wisdom we can find. That is why, after the crack on the surface of reality had been noticed and observed for several years, a delegation of wise men and women went to the King of France and the King of Germany to request—to insist—that their respective governments be decentralized, at least until after this crisis had passed. Wielding political power, they said (quoting the Tao Te Ching, which had been brought back to Europe by Marco Polo a hundred years earlier, at the beginning of the fourteenth century), incurs grave responsibilities and, as with spiritual power, many a good man has wandered off the path and become deeply entangled in the brambles of personal ambition or shortsighted ideals. The truth about power, they said, is that the more you are given, the deeper is your obligation to let go of it. The wise ruler does his job and then steps back: he understands that the universe is forever out of control and that trying to dominate events goes against the current of the Tao; he lets things go their own way and resides at the center of the circle, they said. Our particular royal court was nestled in one of the loveliest regions of France, a valley in which the river Loire winds its languid cerulean S through orchards, meadows, and fields whose lushness of color is equaled only by the luxuriance of their fertility. France is the capital of beauty, and I will have to be careful in this chapter not to get seduced into the purpler regions of English prose. Life at court was very pleasant. The King and Queen spent their days administering their estates, cultivating the arts, and caring for the poor. The palace was a house where all was accustomed, ceremonious, with a custom not dulled, but enhanced, by repetition: the courtiers moved in the stately, fluid motions inculcated by the pavanes, galliards, and other court dances of the time; the air was filled with the sweet sound of music, provided by a full orchestra, a chamber orchestra, and three separate string trios, all of which constituted less than half of the music entry on the royal payroll; everyone enjoyed the daily rituals in which even the lowest-ranking footman had the dignity of an appointed role — the formal levées and couchées, the great state dinners, the poetry readings, the moonlit suppers on the grass at which the ladies’ rustling silks and satins were echoed by the rustling of the leaves; everyone treasured the freedom of a court that allowed the King’s fool to be as barbed and witty as he pleased without fear of a whipping, and the ministers of state to be so in love with the panache of their burgeoning language that sometimes in the midst of a policy speech, enraptured, they would burst into the French equivalent of blank verse. Outside the court, life was almost as pleasant: harvests were plentiful; holidays were frequent, with free food and drink served to the peasantry on the royal picnic grounds along the banks of the river; and it should come as no surprise that even the language of the poor was rich in words that made subtle distinctions between varieties of happiness, words such as blithe, gleeful, mirthful, jocund, merry, and jolly, which in the English of our solemn century have withered from disuse. In fact, the only shadow cast on the perfect well-being of the kingdom was the anxiety that people felt about Unusual Phenomena, although, to everyone’s relief, these had been gradually decreasing until they now averaged only two or three per country per decade. The latest incident (it involved a magic bird and a wicked stepmother who had killed her little stepson, cooked his diced flesh into a stew, and served it to his unwitting father) had occurred five years before our story begins, in a village near the King’s favorite hunting lodge, and was particularly troubling, even though it did end happily. The King, the Queen, the ministers, the courtiers, even the footmen and the Fool, were true Renaissance men and women, each of them skilled in many modes of human activity, and each would be worthy of our attention. 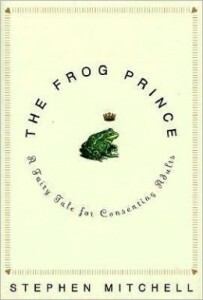 But since all the characters in this story, with the exception of the Princess and the Frog, play no more than supporting roles, it is hardly necessary to describe the intricacies of their lives or to fill you in on their backgrounds: what triumphs and defeats during his long reign had shaped the King into the exemplar of a wise monarch, or why the Queen had ended up insisting that each of the palace’s eighty-seven rooms be decorated in a different shade of purple. There is, after all, only a finite quantity of time to be spent in telling a story, and although it is true that all individual things are interconnected in one vast web of being, so that — because any strand can eventually be followed through the space-time fabric of the entire universe — one could at this point easily shift into the history of wisdom in China or of beauty in France, the origin of species or the origin of reality, the Tao of leadership, the topology of the soul, or the esoteric symbolism of colors, it is equally true that one needs to arrive at the beginning of a story before one can tell it. THE PRINCESS HAS WALKED into the forest on a cool May afternoon and is sitting on the stone rim of the well. She is dressed casually — for a princess — in one of her favorite walking outfits: a wide-sleeved low-necked short-ruffed fuchsia velvet bodice covering an eggshell-colored silk chemise, and a long forest-green velvet skirt over three stiff petticoats (no farthingale). Her long black hair, uncapped today and unpowdered, hangs down almost to her waist, as loosely as a bride’s. She is wearing no makeup but a touch of eyeliner around her dark brown eyes and a dab of blush on her alabaster cheeks, no jewelry but a pair of small gold earrings and her second-best crown, of a thread-thin gold filigree so tactful that you would barely notice it. In her right hand she is holding her golden ball, which seems as bright and beautiful as her own independence. She gazes past the distorted reflection of her face, into its depths. Since the Princess is earlier than usual, the Frog has not yet surfaced to see if she has come. The Frog sits in the mud at the bottom of the well, breathing through his skin. His nostrils are closed. He is in deep meditation. The water feels cold but comfortable. There is a small eddy near the surface; or is it near the surface of his mind? He sits motionless, silent except for an occasional, inconsequential croak. Neither the Frog nor the Princess has any inkling of how utterly their lives are about to change. We are now poised on the brink of events, the fulcrum of the story: the fulcrum of the universe. And what a pleasure it is to be here! How I love the beginnings of things: the first glint of dawn, the blank page, the vastness in an infant’s eyes, all those shimmering moments when life is filled with pure possibility, and one would do anything — almost anything — to prolong the wonder of it. Verweile doch, du bist so schön! “O moment, you are so beautiful, stay with me a while longer,” as Faust said in another context. But the Princess is about to lose hold of her golden ball, and our story as a result is about to roll over the edge of becoming. This is the crucial moment. All right. Let us stop now and focus our attention on the Princess’s right hand. Up to this moment, she has been holding the golden ball, as she contemplates it, in the middle of her palm, with a grip neither too loose nor too firm. Her hand has been alert all through its nerves and fibers, alive with awareness, a concentration of her entire body. Up to this moment. And now, suddenly, the hand forgets itself. It grows limp. Its fingers uncurl. The golden ball totters, rolls half an inch backward, half an inch forward, pauses for an instant, then rolls down the ramp of her three middle fingers, over the edge of the fingertips, through two feet of air and into the well, with a loud, peremptory splash. A star falls through the sky and we make a wish. To us it seems that the star is falling. But to the inhabitants of the star, the star is going neither down nor up but is stationary in a sky that proceeds along its ordinary course on a day like any other. Up and down are, after all, relative in the world of physics, and in the world of the soul they are often one and the same. What we are tempted to call a disaster is sometimes the first, painful stage of a blessing. A rare and gifted person at the height of a soul-crisis can see that there is an intelligence that shapes our ends, rough-hew them as we will. And though on ordinary days we may persist in clinging to our own agendas, though we may think we know what is good for us and keep trying to make it happen, what we want is not necessarily what we deeply need. Some presence inside us knows better. That presence is the author of apparent disasters. This can be stated from a slightly different perspective: Character is fate. Even though we are passionately attached, as personalities, to the stasis of our ordinary discontents, sometimes the critical moment arrives when on a deeper level we are ready for the world to fall apart. At such moments a disaster is precisely what we (unconsciously) long for. The Princess comes to herself. A brief fibrillation thrills through the nerves of her empty hand. She sees the splash. She bursts into sobs. Mitchell’s [book] is a miracle of the Now. The reader moves through it with eyes wide upon the concrete and the fantastic at once. Stephen Mitchell’s spiffy, creative, and endearing reworking of the classic Grimms’ fairy tale draws from the wellspring of his extraordinary translations of great religious texts. Like Meetings with the Archangel, which he called “a comedy of the spirit,” this work of imaginative prose is a free-fall into the kind of perennial wisdom that stirs the soul. It is a delight from start to finish… The Frog Prince will transport you into a realm where you’ll experience afresh the marvelous surprises of the soul’s thermodynamics. Mitchell winds a tight and even suspenseful tale, reinvigorating the old story with quirky, believable characterization and good advice for living in a relationship. Stephen Mitchell comes up with an endearing, fresh telling of this old tale. He is inspiring, and his writing is luminous and lyrical. He actually gives us a mini-novel, complete with colorful characters, a properly paced storyline, quiet emotional punch, and much wisdom… And the value of the lesson? Inestimable.